To win your way to the Iron Throne, you must command the characters that flock to your banner, but you must also weave cunning plots to shape the future of Westeros. To this end, you use two distinct decks: a plot deck and a player deck. The player deck contains the characters, locations, attachments, and events that you hold in your hand, marshal into play, and use to defeat your opponents and claim power for your faction. The plot deck, on the other hand, consists of seven carefully chosen plot cards, which represent schemes, tricks, and maneuvers that you may use to gain the upper hand in a game round. The plot deck is not shuffled like your player deck. Instead, you must consider your available plots at the beginning of each round and select a new plot, forming a plan for how you will win your way closer to the Iron Throne. Your plot sets the rest of your plans in motion, determining your income for the round, your initiative value, how powerful your challenges will be, and how many cards you can keep in your hand at the end of the round. Your plot may also have a special effect that triggers immediately or persists throughout the round. For example, as your plot, you may select Wildfire Assault (Core Set, 26). This plot has an income value of four, giving you four gold dragons to spend marshaling characters, locations, and attachments, and playing events for the rest of the round. Wildfire Assault also has an initiative value of seven. The player with the highest initiative value selects which player will play first for the round. The third number on the plot card is the claim value, which determines the power of your challenges, as we’ll explore below. Wildfire Assault also has a reserve value of six, meaning that at the end of the round, you must discard down to six cards. 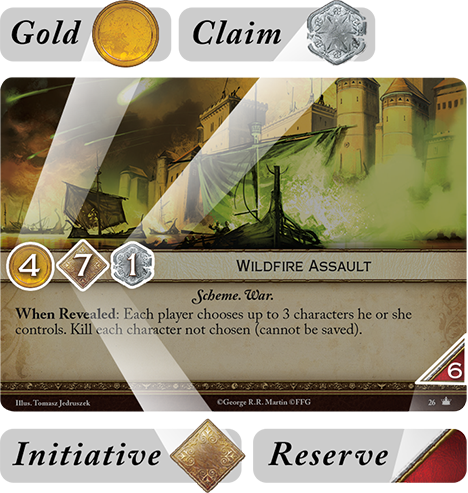 Finally, Wildfire Assault bears the text, “When Revealed: Each player chooses up to 3 characters he or she controls. Kill each character not chosen (cannot be saved. )” A deadly hail of wildfire can quickly thin the amount of characters in the game. 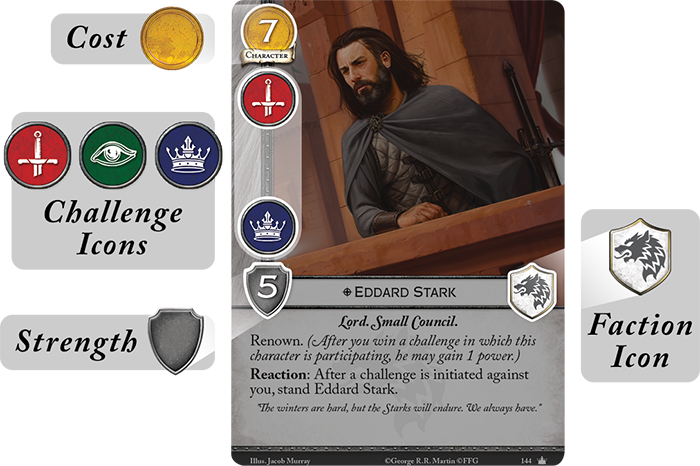 Because you can choose any unused plot in your plot deck at the beginning of a round, a well-constructed plot deck gives you tremendous flexibility to repel your opponent or seize the power you need to secure your claim to the Iron Throne. The best schemers in A Song of Ice and Fire always have plans within plans, and your plot deck gives you the chance to be just as prepared. Inevitably, you and your opponents must clash as your Great Houses struggle to gain power. 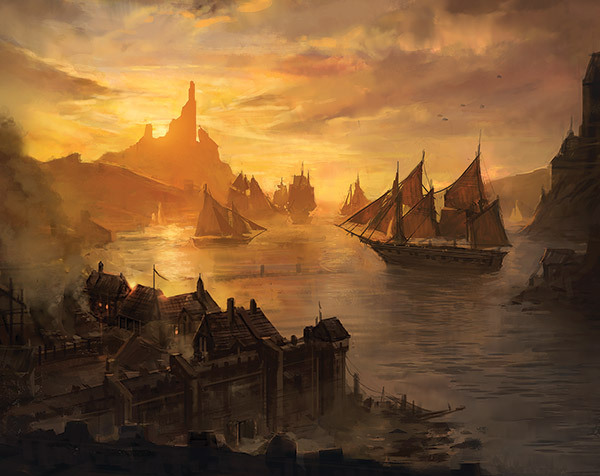 After choosing plots and drawing cards, all players have the chance to marshal new characters, locations, and attachments, mustering your fleets on the Iron Isles or calling your banners to Sunspear. After marshaling, you clash with other claimants to the Iron Throne! You can challenge your opponents on the field of battle, in back-alley intrigue, or in the political arena. 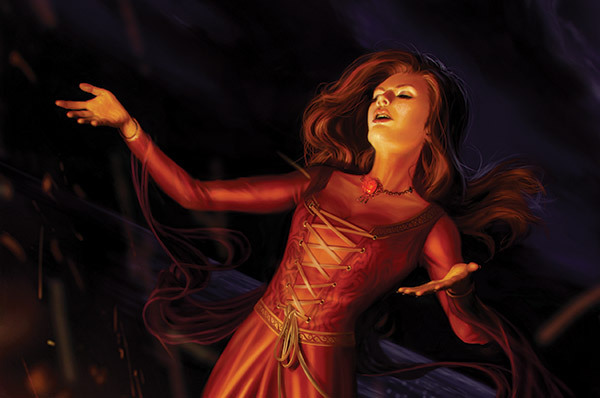 There are three distinct challenge types in A Game of Thrones: The Card Game Second Edition. A military challenge allows your warriors and armies to face your opponent’s forces in pitched battle. If you win a military challenge against your opponent, he must choose and kill a number of characters equal to the claim on your revealed plot card. Killed characters are placed in a dead pile, and unique characters cannot be played while they have a copy in the dead pile. Intrigue challenges pit your schemers, assassins, and spies against your opponent in shadowy manipulation and subterfuge. 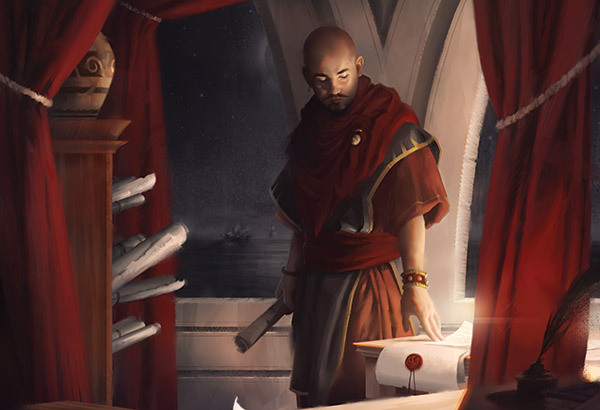 If you win an intrigue challenge against your opponent, he must randomly discard a number of cards from his hand equal to your claim, reducing his options for future turns. If you can win enough intrigue challenges against your opponent, you can substantially reduce his ability to fight back against your forces. Power challenges enable your most influential characters to undermine your opponent’s political position and increase your own. If you win a power challenge against your opponent, you move power tokens equal to your claim value from his faction card to your own. Power challenges are one of the principal ways for you to come closer to victory and the Iron Throne. You can initiate a challenge by kneeling one or more of your characters, and your opponent can respond by kneeling character to defend. A character must bear the corresponding challenge icon to be declared as an attacker or defender in a challenge. You also have the chance to affect the outcome of a challenge by using special abilities and playing event cards. An unexpected tactic or sudden assassination may turn the tide of the challenge abruptly in your favor! After both players have decided to pass on the opportunity to take more actions, the side with the higher total STR is victorious. Every character in the game bears a certain amount of Strength, or STR, and the variables of STR and challenge icons give tremendous variety to the characters that support your claim to the Iron Throne. For example, Eddard Stark (Core Set, 144) has a STR of five and the military and power challenge icons. Eddard Stark features a high STR, but because he lacks the subtlety to possess an intrigue challenge icon, a single spy may slip right past him for an unopposed intrigue challenge. 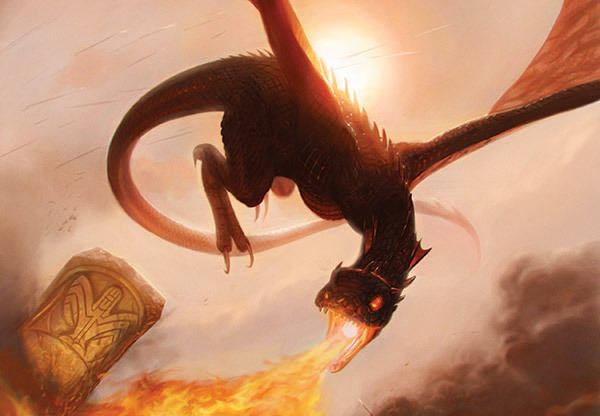 How you choose to challenge your opponent and which characters you commit to your attacks and defense are the principal ways you may gain superiority and victory in A Game of Thrones: The Card Game Second Edition. A Game of Thrones: The Card Game Second Edition gives you the chance to battle for the Iron Throne in two unique game experiences. Two players can enter the lists to engage in a joust, fighting honorably for the glory of victory, or multiple players can partake in a chaotic and ferocious melee, adding new levels of treachery and backstabbing to the game. With a single Core Set of A Game of Thrones: The Card Game Second Edition, you can play a four-player melee, but with two or more Core Sets, you can play a melee with up to six players. 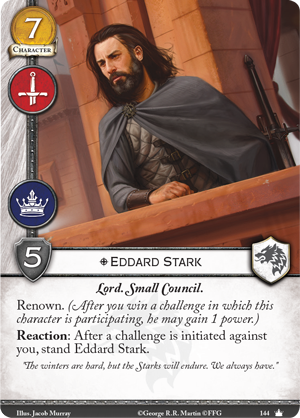 When you play a melee game of A Game of Thrones: The Card Game Second Edition, every player takes his place in the king’s Small Council by selecting a title. These titles come with pre-existing allegiances and enmities. If your chosen title supports another player’s title, you cannot challenge this player, although he is under no such restriction! If your title opposes another player’s title, you receive a bonus power token the first time you win a challenge against that player. 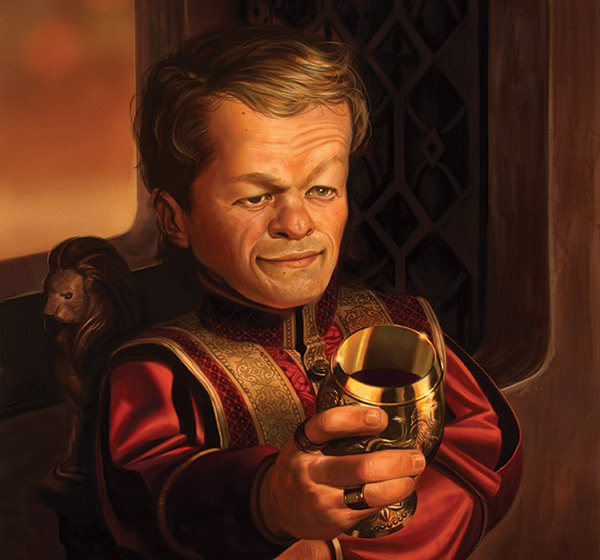 Every title also confers a specific advantage to the player who selects it, drawing you deeper into the world of Westeros and granting you the tools to subvert your opponent’s plans. In the diagram above, green arrows show a title's support and red arrows show which titles oppose each other. You and your opponents return your titles and select new ones at the beginning of each round, so as the game continues, you will bear many different titles, shifting your allegiances in whichever way brings you closest to the Iron Throne! You’ll take control of numerous factions in A Game of Thrones: The Card Game Second Edition. Each faction offers a unique playstyle, allowing you to call upon new tricks and tactics in any deck you play. You may command a longship with Asha Greyjoy or follow Syrio’s training with Arya Stark. You may safeguard the princes of Dorne with Areo Hotah. You may even pledge your strength to Tywin Lannister and support the lions’ claim to the Iron Throne! Faction cards are double sided: the front is the main faction card, while the reverse side is an agenda that allows you to include non-loyal cards of that faction in another deck. A starter deck for every faction is included in the Core Set. 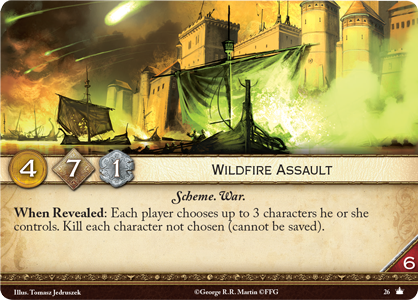 You can make your deck with cards from a single faction, but like A Song of Ice and Fire, your games of A Game of Thrones: The Card Game Second Edition are filled with alliances. Every deck has the option to use an agenda to call upon the support of another faction. If you call upon the support of a faction by using its agenda, you can include cards from that faction in your deck free of penalty. The exception to this rule is loyal cards. 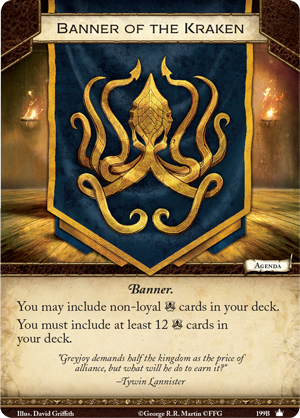 Loyal cards include characters unshakable in their devotion to their House, locations intrinsically tied to a faction, or events that represent tactics used only by a single faction. Loyal cards can never be included in another faction’s deck. "I will not treat with Renly," Stannis answered in a tone that brooked no argument. "Not while he calls himself a king." Choose your faction and your allies in the war-torn lands of Westeros, and marshal iconic characters and massive armies to your aid. The fate of the realm hangs in the balance – the one who sits the Iron Throne will shape the next era of life in Westeros. Only the most fearless, most devious, and most ruthless will triumph in A Game of Thrones: The Card Game Second Edition! What Are the Differences Between the Editions? 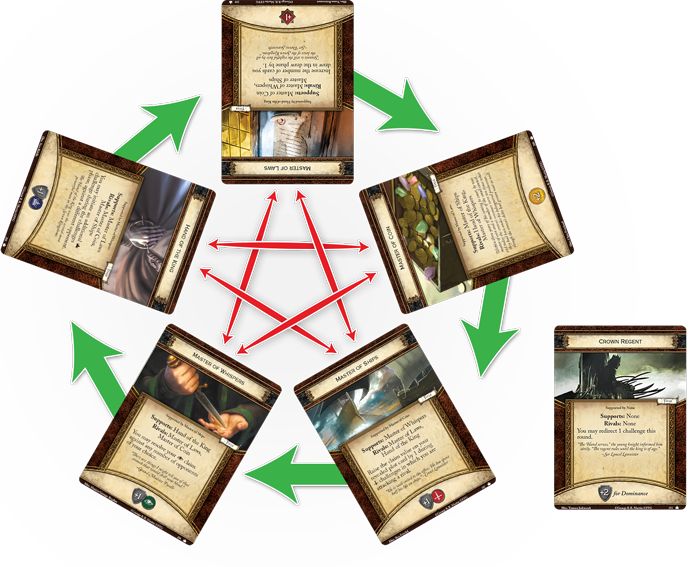 As A Game of Thrones: The Card Game transitions from its first iteration to the second edition, some aspects have been changed. These changes can be divided into three basic categories: elements being cut, elements being revised or updated, and new elements. A number of elements are being cut from the new edition because they have been deemed obsolete or unnecessarily confusing. The influence resource was a holdover from the game’s CCG era, and because gold now persists through to the end of the round, influence is unnecessary. Another game mechanic that will disappear in the second edition is crests. 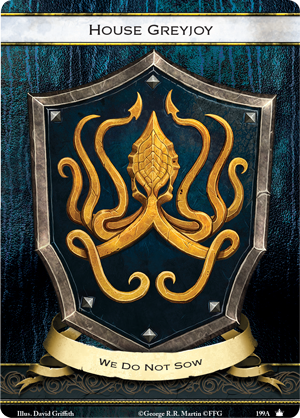 Crests offered nothing to distinguish them from traits, and made the game more difficult for new players to learn. 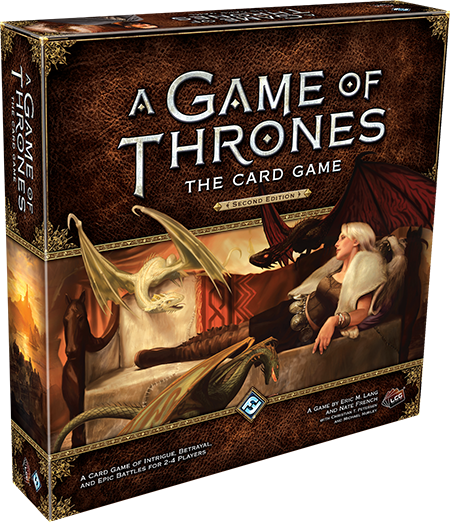 The first edition of A Game of Thrones: The Card Game also contained too many keywords for players to easily remember. In the second edition of the game, existing keywords have been pruned and some new keywords have been added to showcase the most interesting and essential interactions. Other elements are being revised to improve the play experience of the game. The timing rules of the first edition were a frequent obstacle to players attempting to enjoy the game, and are being overhauled in the new edition. Moribund, passive effects with triggers, and save/cancel responses will be replaced with a more straightforward timing system that takes advantage of the Interrupt, Reaction, and Forced triggers that have been successfully employed in some of our newer LCGs. The draw cap is also being replaced. In the first edition of the game, the draw cap was a necessary band-aid to prevent decks from harnessing massive draw power, but it was not a part of the original core design, and it forced players to mentally track the number of cards drawn per round. In the second edition, a reserve value is included on plot cards, and this value caps its controller's hand size at the end of each game round. For example, if a plot has a reserve value of five, you must discard down to five cards at the end of the round. In addition to these other changes, the gold curve is being expanded to better reflect the range of abilities between different characters. In the first edition, two characters could have the same cost, but vastly different strength levels. Expanding the gold curve allows greater variance between these characters. The entire attachment card type is also being modified to make it more robust, because many players felt that first edition attachments were more fragile than the other card types. Finally, new features being introduced to the game for the first time. The faction pool is expanding beyond the six Houses players have come to know in the first edition, with the addition of two new factions to the pool. New deck building rules empower players with more options in combining factions, alongside a means of building more focused and specialized plot deck. Additionally, the game is being given an exciting graphic overhaul that presents a treasure trove of beautiful new artwork. While other differences are present between the first and second edition of A Game of Thrones: The Card Game, these are the most important. For more on the transition to the game’s second edition, visit this letter to the community by our lead LCG designer, Nate French.